The Tacx Flux S looks very similar to the Tacx Flux, but the littlest direct mount trainer from the Netherlands has had a thorough reworking. With Tacx having dropped the price further, is it enough to unseat the Elite Direto from the crown of the best budget buy? It has been a busy 2018 for the team at Tacx, they have been working hard to get the Tacx Neo Smart bike out of the door, updating the Neo to Tacx Neo 2, bringing the Tacx Flux 2 to market, and giving the original Flux a spit and polish to give the Tacx Flux S, which I feel may be a touch more disruptive to the market. It was an open secret that the original Tacx Flux had a slightly troubled birth, while those issues were resolved with the initial Flux, it may be one of the reasons that we do not see a whole boatload of additional features – such as the integrated cadence sensor included with the Tacx Neo 2. We are getting a significant overhaul of the internal components. Each trainer will have a profile showing the minimum resistance, or gradient simulation it can simulate at a certain speed. So on the above graph, the i-Vortex can produce a 7% resistance, up to about 23kph, and 270 watts. As this related to the strength of the brake. On the i-vortex the brake was an electromagnetically generated 11.81kg, so with the above graph, if you went over about 300 watts, you’d overcome the limited brake strength. By about 500 watts, the unit would only be able to generate 3% gradient. So how does all of this relate to the copper plates inside the Tacx Flux S? Using copper results in a much higher braking resistance, in fact almost apply three times the braking capacity at low speeds of the original Tacx Flux – so you’ll be able to simulate the 10% grade at the lower speed. There also the secondary benefit of using copper allows a much higher flywheel effect. Tacx claims that this means the Flux S has the highest inertia of the current flywheel smart trainers on the market. (I think that noise was the sound of a dutch challenge being thrown!! However as a personal peeve – in spite of the significant redesign of the case, 1mm couldn’t have been shaved off the bottom to allow the Tacx ANT+ sensor to slide perfectly underneath?? As a side note, without a doubt, if you are using ANT+ the Tacx “tank” as I like to think of it is the best antenna out there. It’s a block of resin! I’ve destroyed too many simple USB dongles with cleats, this thing, just doesn’t care! Of note, there is no separate power adapter, which personally I like, just a standard kettle lead. The fewer power adapters I have to lose or stand on, the better! The legs on the Tacx Flux S are very separate, and a very discrete component in the box – they are steal encased in plastic, and as a result are not very light. It is worthwhile noting that the plastic underside of the Flux S legs, had come apart in transit, but that was quickly pushed back in. 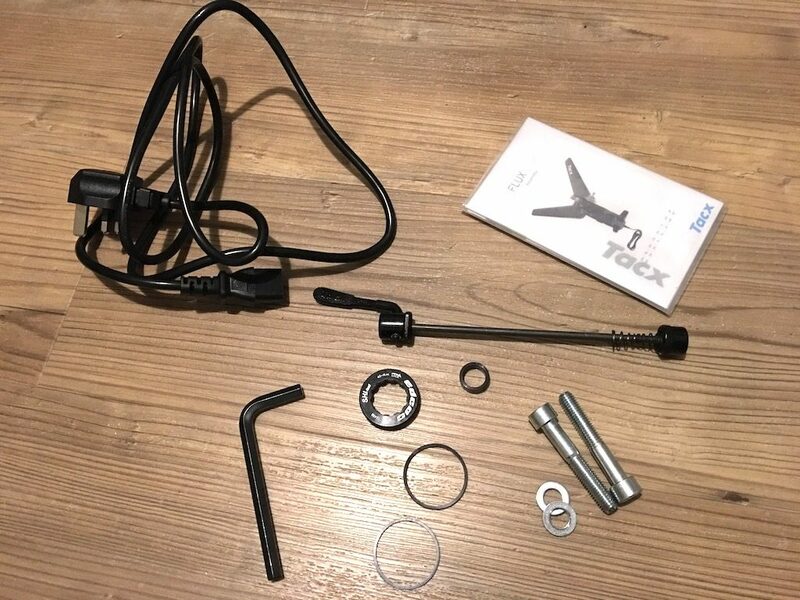 While Tacx has opted for a completely fixed design with no facility to fold the Tacx Flux S up – the legs NOT amenable to regularly being removed from that metal and plastic sandwich, I’m surprised with the case tweaks, a handle did not appear. Sure the Elite Direto handle isn’t really the last word in ergonomics, but it’s better than nothing! The lack of the handle on the unit, anywhere, reinforces the view that Tacx intends you to set up the Flux S and leave it standing. Once the unit is together, it’s time to apply the cassette. Tacx does not provide one in the box, but I can see the logic, especially as a great many people like to mimic their road setup, so use the same cassette as their outside gears to help with training. Thankfull there is no return to the hybrid hub with the Tacx Flux S, sporting the more common Shimano hub. At this point, your set up is just about good to go but let’s complete the walk around of the unit before we get onto the riding. Speaking of power, as mentioned the Tacx Flux S has an integrated power adapter, which I’m quite pro. Given that the Tacx Flux S is very much a device to be setup, and left alone, I like the single kettle lead. It makes it much easier to buy an extension (if needed) to properly install the Flux and cables in your pain cave. There may be some people who don’t like the idea of an integrated transformer, but I know vastly more people who have lost power packs for devices, rather than had them die! With that, we’re probably nearly really to go for a spin! You can perform the calibration in Zwift if you select the Tacx Flux S as the power source as well as the trainer. 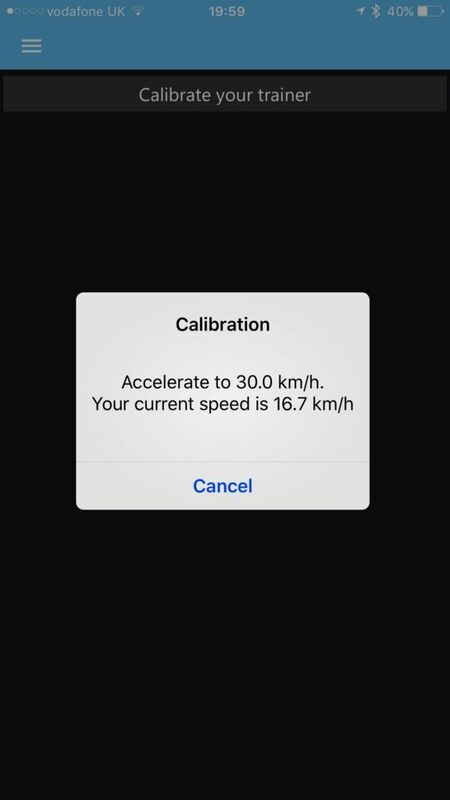 I do think it is worthwhile doing the FIRST calibration on the companies own app, as you’ll also get a notification as to whether there are any new firmware updates. Other than that, you don’t really need to calibrate unless moving the units. So with everything plugged in, updated calibrated, it’s time for the Zwift Gear Test! Let’s look at the data away from the video, as you can see the Tacx Flux S has a note is relatively coarse, but not significantly different from the Direto. But with both trainers, don’t try and put sleeping babies in the next door room! Now I’ve been mainly riding the larger trainers, Tacx Neo 2, Elite Drivo 2 and the Wahoo family of late. When the Tacx Flux was released, it felt like quite a planted trainer. Compared with the other trainers on the market, it is noticeably easier to move from side to side. That’s not to say I felt as though there was even a remote chance of me knocking it over, more a reflection of how far the field as moved. Huh, what? Surely missing out is missing out, isn’t it? As discussed in the Wahoo Climb review – the default setting of zwift is 50% trainer difficulty, meaning even in the 18% NYC climb, the trainer is only ramping up to 9%. Yes if you want ultimate gradient simulation, you’ll not get that here, but 90% of riders never change their Zwift trainer difficulty anyway, so you’re likely not missing out! Taking things through the esses on Watopia gave smooth power return, and resistance response, but whilst smooth I would sometimes feel a fraction of a delay, the climb seeming to bite just after my rider has started on the uphills, but this is something most manufacturers have seen and dealt with over firmware, but definitely something to watch for. I also noticed an occasional sound coming from the turbo, but only really audible when coasting, I couldn’t manage to record it on my phone, so just left it be, and assuming it was something I had missed when testing the unit earlier. In the Tacx Flux S box is also a 1-month premium subscription to the Tacx Desktop app. Admittedly you get a better experience in the cities where the maps are more developed, but I feel that this is indeed one aspect of training which is not covered by Zwift – essentially IRL course training. Now I’ll be honest, I’ve written this a little out of order. As the Tacx Flux S does need calibrating, I decided to do the first power meter test, uncalibrated, for interest’s sake. Um… that looks a little bit like a dog’s dinner. I calibrated everything immediately after to repeat the second test so that all other conditions were equal. The biggest thing to notice is that the Tacx Flux S is showing a little more smoothing compared to the other power meters. I’m not too fussed there, as we are dealing with a 3% variability unit which is at the end of the drive train. Perhaps a touch smoother than some of the other trainers which have been tested lately. But that feels a little unfair, as the Tacx Neo 2 and the Elite Drivo II are actually running at <1% variability. To my mind the Tacx Flux S suffers from being “the youngest child” – I know it’s not chronologically the youngest Tacx direct drive unit, but it is the cheapest. That presents a bit of a problem. At £549, the Tacx Flux S is coming in around £100 less expensive than the Elite Direto, to which it is so often compared. That’s a touch unfair, as for that additional money, you are getting a grade higher trainer.